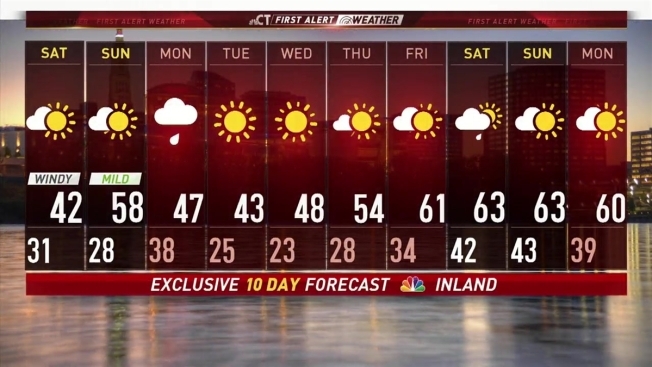 The NBC Connecticut meteorologists continue to track snow showers that could leave behind some accumulation overnight. Icy conditions caused some crashes on Interstate 84 in Tolland County Friday. Snow will develop in the hills both east and west of Hartford Friday evening and become heavy overnight. We're forecasting one to three inches of snow for most of the hills with three to five inches possible in the highest areas of northwestern Connecticut. There could be a minor coating of snow in the valley and on the shore. The weekend starts with some chilly weather, with wind and a high temperature of 40 degrees on Saturday. It will feel more like Spring on Sunday when beautiful weather arrives and the high temperature gets to around 60 degrees. Get updates on the forecast here.